There could be many reasons why your Paypal Plugin is not working. This guide lists most common reasons and solutions for them. You have created a menu for the Checkout and set its access level to Registered or Special or Something other than public. You have disabled IPN in your Paypal account. If you have a firewall like Admin Tools, then you can add Exceptions. Please consult with your firewall provider or with your host. Paypal makes a remote post (IPN) to your site when a payment is made to inform us that payment has been made and you can mark the order complete. Firewalls normally block remote posts. So we may have to whitelist the IPs allowing them to do the remote post. Enable the IPN in your Paypal account. Click Profile on the My Account tab. Click Instant Payment Notification Preferences in the Selling Preferences column. Click Choose IPN Settings to specify your listener's URL and activate the listener. Still no luck, check the IPN HistoryLogin to your paypal account and go to History -> IPN history. Check the recent IPN history and check the status.If possible take a screenshot and contact our support team. Are you using your Primary Paypal Email as your merchant email? If your order status says failed, then chances are that you are using a secondary email of your Paypal account. Paypal allows you to add multiple emails in an account to accept payments. With the Paypal plugin for J2Store, make sure you are using your primary Paypal account email. You can check which is your primary email by signing into your Paypal account and then going to Profile -> Add / Edit emails page. If your currency is not supported, Paypal will automatically assume the currency as USD. A workaround to this problem : Allow customers to shop in your currency and convert it to USD when they are redirected to paypal for payment. 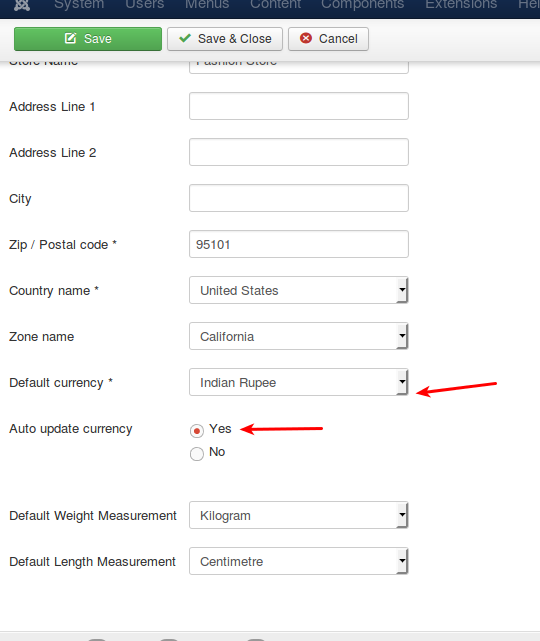 Here is a step by step guide to set up auto conversion of your currency to USD. Let us assume, your store is located in India and your currency is INR. But Paypal does not support INR. Here is how you can overcome the issue. You are all set now. Prices in your store will now display in INR. When the customer is redirected to paypal, he will be asked to pay in USD.J2Store will automatically do the currency conversion depending on the prevailing exchange rate. If this were to happen, one of the reasons could be that the configuration in Paypal is set to not accept duplicate invoices. You may receive orders from various places and if the invoice numbers are the same, Paypal recognises there is an invoice duplication. There are two ways, by which you can fix this. Under Block Accidental Payments choose "No, allow multiple payments per invoice ID". 5. Paypal option not showing at checkout? Make sure the Geozone field at paypal plugin configuration page is set to ALL. Go to J2Store > Setup > Payment methodsOpen Paypal payment pluginSet Geozone to ALLSave. 6. Is your order still not auto confirming the status? Here is one more troubleshooting stepGo to Joomla administration -> Global config -> Server -> Database settingsMake sure your Database driver is NOT set to MySQL PDO. Is your PayPal's account default currency is different from your store currency ?Only if the currency is different, PayPal will send the payment status as Pending. Login to your PayPal account -> profile -> Selling preferences. Allow payments sent to me in a currency I do not hold:Set this to: Yes, accept and convert them to US Dollars. Additional charges apply. If PayPal sends the payment status as Completed, J2Store will automatically mark the transaction as Confirmed.